The magnet is a metaphor for anticipation, which is both a product of and shapes feelings, emotions and experiences of time. This process is mediated by both trans community discourses and medical systems. It’s very important to note that the majority of research participants had good things to say about the health professionals who helped with their transition. However, there is also a high prevelance of transphobia and cisgenderism within medical systems and clinical pathways. Anxiety and mistrust of practitioners within the trans patient population is endemic, and this is compounded by long waiting times. 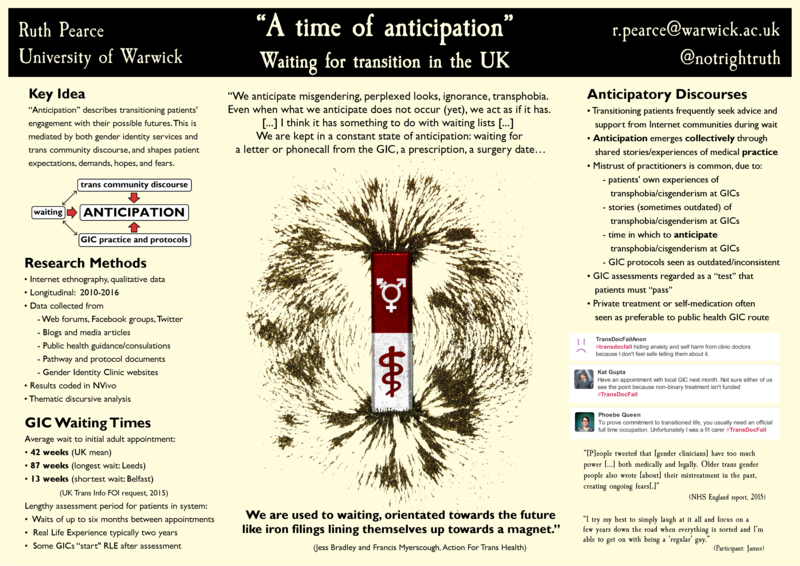 My wider research looks critically at how discourses of trans health are differently understood within and between community/support spaces, activist groups and the professional sphere; however, the purpose of this particular poster was communicate some of the difficult experiences that current patients have with waiting. It sparked some productive conversations and I hope that further work will follow from this.